The Umbrella Cockatoo is a commonly owned bird, yet also a commonly neglected and discarded one as well. When many potential owners seek cockatoo birds for sale, many fail to understand the level of care and responsibility necessary for owning an Umbrella Cockatoo—or for that matter the Moluccan Cockatoo, or many other relatives of the parrot. Like other relatives of the parrot, an Umbrella Cockatoo is quite intelligent. While still animals, they can mimic speech and require a great amount of mental stimulation. They become bored easily, much like small children, and need time to explore and play. Toys and puzzles for them should line their living space, and they should have plenty of time outside of their cage to roam. Their habitats should be large enough to facilitate room for toys and some room to move around. As with many intelligent birds, cockatoo bird cages should be as large as can be afforded. They need space to move around, and will be prone to screeching or anxious behavior when they don’t have enough. To adequately feed an Umbrella Cockatoo requires more than just commercial pellet feed. While there are some organic mixes of dried vegetables and fruits; often the best option for your bird are fresh foods supplementing a pellet diet. Nuts or seeds should be occasional treats, while fresh fruits and vegetables should be on the menu every day. A properly cared for cockatoo parrot is a life long friend. They are known for being affectionate, and love getting petted by their human companions. 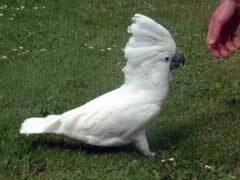 However, if an Umbrella Cockatoo missing a vital piece of their daily care will develop behavioral or health problems. This is why it is so important to be knowledgeable on the care of these birds, and to make the informed decision when purchasing one.